Many thanks for the comments fellow bloggers. Isn't this exciting? I have so much to learn. I mis-typed helicopter earlier and am still trying to work out how to edit it. LOL I want to run before I can walk, typical of me. I am looking forward to learning so much, to joining in other bloggers challenges, I have been looking at lots of blogs for a long time, so I am on my marks, ready, set and raring to go. 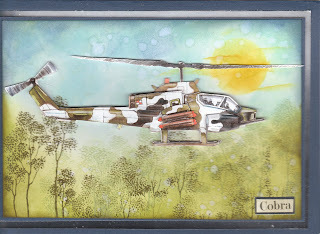 Decoupaged helicopter - I needed to make the simple deoupaged helicopter more exciting for a grandson's birthday. Again I used TH Distress inks, direct to card, dipped by fingers into a cup of water and splashed the water onto the background. Dried the card, using 3 different TH Distress inks I stamped the trees, with a stamp from Elusive Images. Mr. Fix-it was my first stepper card, I found it wouldn't stay up so I fixed a bar between the back and the front which worked a treat. 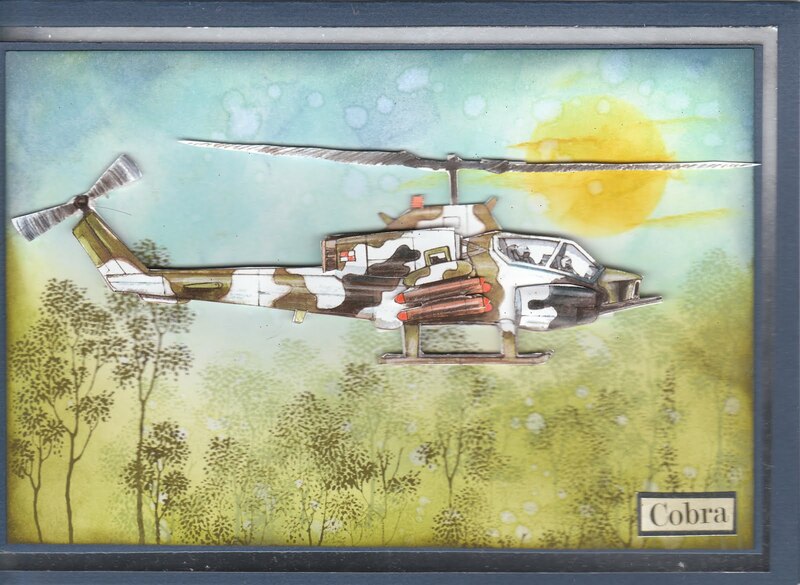 I have used Tim Holtz Distress inks, as watercolours. The skin tones are Promarkers. Hello everyone in Blogland, not being competer literate, it has taken me a long time to manage to get into blogland, but now that I am here, I am hoping to be a regular blogger.